The spherical tokamak has a number of advantages over the standard tokamak design. It offers the promise of achieving fusion with cheaper construction costs and lessened energy demands. Results achieved so far indicate it would be a good design for a fusion power reactor, still using conventional deuterium and tritium fuel. But due to the advantage of years longer in development something like the ITER project is likely to come on-line first. Results from spherical tokamaks are being used to aid in the design of ITER. Ultimately, though, the design could prove a better long-term prospect for producing nuclear fusion alternative energy in this way - that is by the magnetic confinement route. The first one built was in the United Kingdom at Culham, site of the combined European JET project. 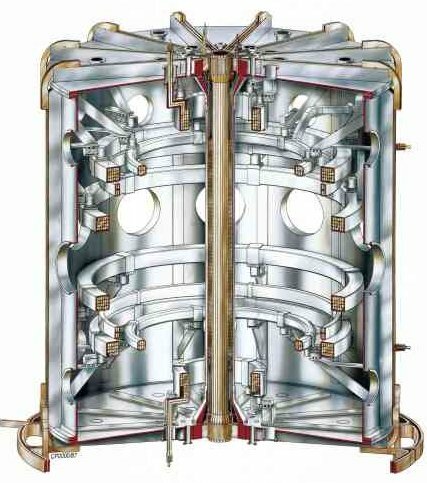 The initial design, the START, standing for Small Tight Aspect Ratio Tokamak, was built from existing materials and achieved its first plasma in early 1991. Behind the design was the idea of creating a unit that could produce a tokamak-like plasma in a much smaller space. In doing so higher pressures can be applied. And a smaller unit makes for smaller coils to provide magnetic fields to confine the plasma. Theoretically fusion power should increase at the square of the pressure. Small increases in pressure can massively increase fusion output. 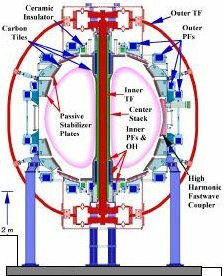 The lower magnetic requirements of the spherical tokamak design also mean that supercooling of the current tokamak conducting coils is not required - a huge saving in space and cost. Fusion scientists talk of a beta figure - a representation of pressure developed compared with the magnetic field required to confine the plasma. The higher the beta the more efficient is the design. 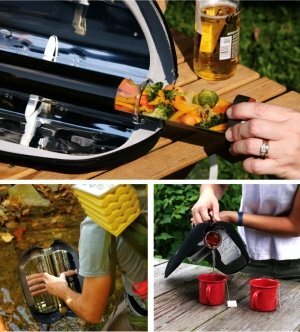 START exceeded expectations in its results with a beta of 40% or 0.4. 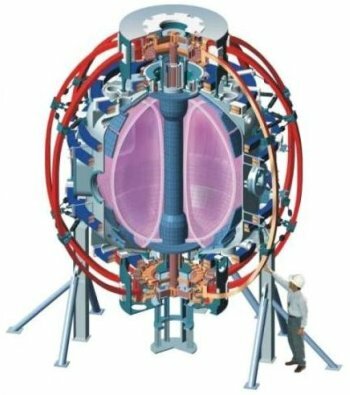 Encouragement from the UK spherical tokamak led to Princeton Plasma Physics Laboratory designing their own apparatus. 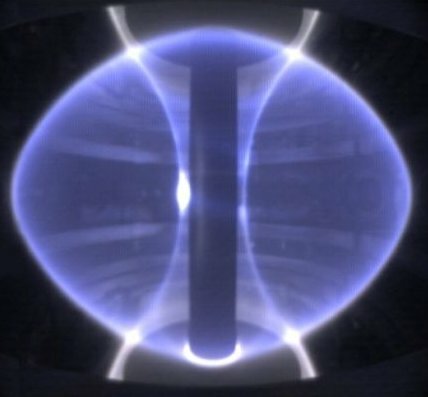 The NSTX (National Spherical Torus Experiment) produced its first plasma in February, 1999. There are important design differences between the British and American projects. The standard tokamak idea relies on a solenoid in the centre (or core) of the apparatus, through which a transformer can release varying pulses of current. This creates its own magnetic field, which in turn induces a current in the plasma within the internal structure - the so-called bootstrap current. 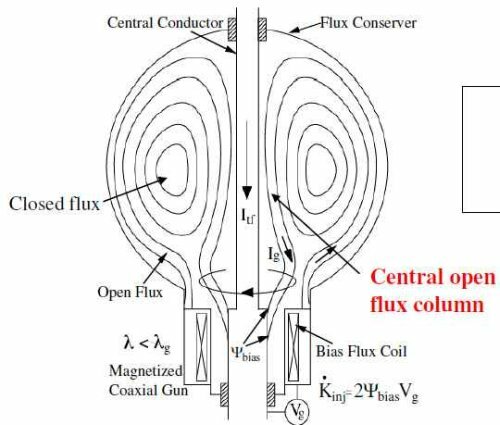 The plasma current produces its own magnetic field which serves to confine the plasma and causes ohmic heating in the same way sending a current through the resistance of a tungsten filament in a lightbulb causes it to heat to produce light. The end point for the plasma is simply to heat it, to increase the acceleration of the ion particles, especially the postively charged nuclei, which increases the chance of collisions to produce fusion. The British versions START and the later MAST - Mega Amp Spherical Tokamak, begun in 2000, with more advanced diagnostics - still rely on a central solenoid to produce the heat. Obviously to achieve the compressed design of a spherical tokamak, the solenoid needs to be constructed in a compressed or denser way than that in a conventional tokamak. Extra heating is achieved through neutral beam injection - accelerating nuclei which are combined with electrons immediately before injection to allow them to cross the magnetic fields and enter the plasma. 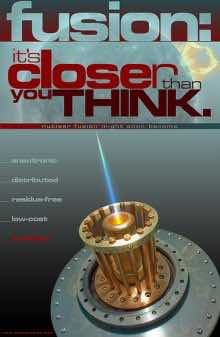 From 2006 the US Princeton Plasma Physics Laboratory NSTX current has been generated by what is known as Coaxial Helicity Injection or CHI. Developed in a couple of structures HIT & HIT II at the University of Washington, the technique has proved very useful and efficient. At one end of the "core" of the spherical tokamak current is passed through a number of circular electrodes inside the vacuum chamber which serves to confine the plasma. This induces a magnetic effect on the plasma begining at the end it is closest to, then spreading out mushroom-like, expanding the effect and folding in on itself much like a solar flare on the sun's surface. As a consequence the central doughnut plasma forms with a bootstrap (plasma) current. Even when the current pulse passing through the circular electrodes stops, the plasma current continues for some considerable time afterwards. The small units in the University of Washington produced a six times greater power effect in the plasma than what was applied to the electrodes. The NSTX proved the benefit scaled with increasing unit size, producing a thirty times magnification effect. Both the British and the US projects aimed for further improvements in the initial designs. NSTX at Princeton has been trialling a lithium lining in the chamber to mop up impurities. A thin solid wall of lithium coats the internal lining of the confinement chamber. As neutrons and other particles interact with it, it liquifies and absorbs the strays, keeping them confined to the wall preventing plasma contamination and reduced efficacy. The newer version produced its first plasma in 2008. By 2010 a complete lithium wall was established. These design features give important references for the development of ITER. The NSTX improvements aim to double the temperatures achieved and increase the duration of the established plasma four times. PPPL would like to achieve recognition of its advances to allow it to be involved in the future the US fusion development program. 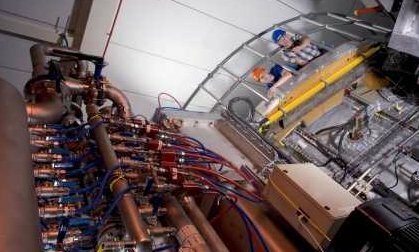 MAST is upgrading to produce greater pressures and heating with a double neutral beam injector at one side and a single "off beam" one on the other aimed to enter nearer the top of the chamber where magnetic forces are lower. The spherical tokamak design has shown a number of advantages over the standard tokamak for alternative energy production. Results have if anything exceeded expectations. With the ITER project blowing out to billions of euros (or dollars) in its construction, a design that can achieve ITER goals at much lower cost and size would be welcome.